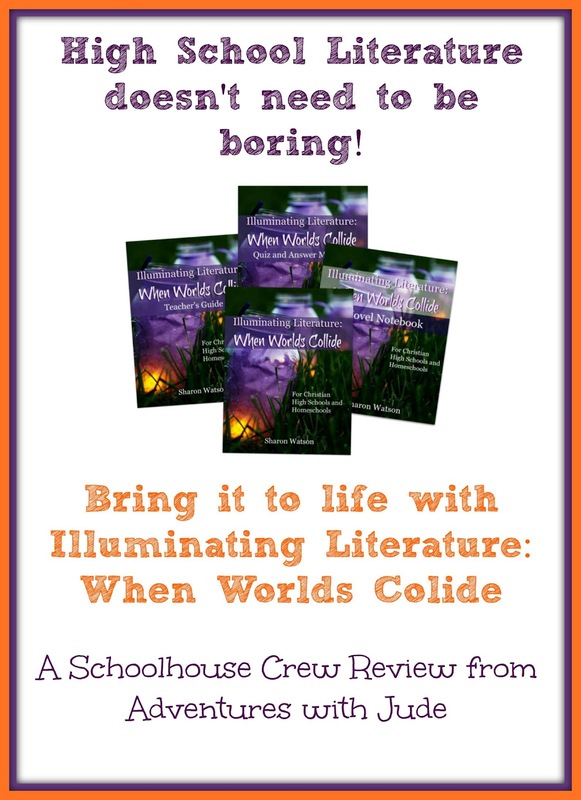 High school literature can be a challenge. You want to make sure you read the "right" books (ie, the ones highlight literary concepts) but don't want to choose ones that your student can't relate to. Did you know that most of the books that we consider "required reading" for high schoolers were actually written for an adult audience? It can be hard for teens to relate to many stories because they just don't have the same life experience, and often makes literature seem "stuffy" and "boring". 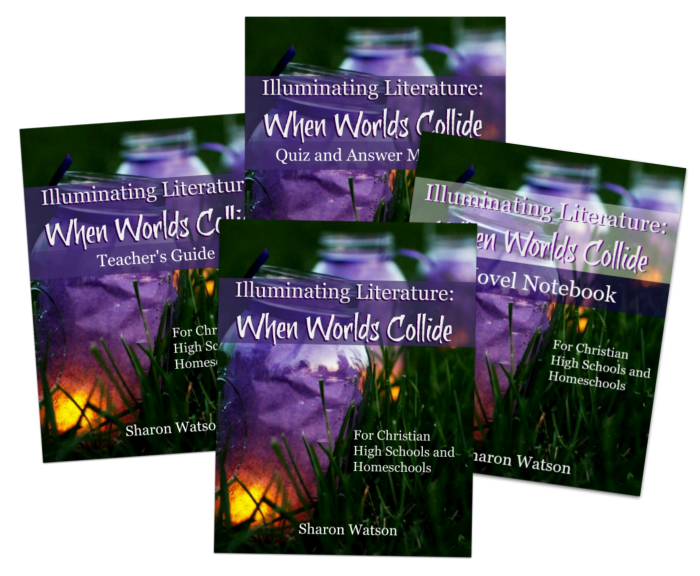 Illuminating Literature: When Worlds Collide curriculum from Writing with Sharon Watson is a way for your student to learn literary classics in a relaxed and conversational manner, free from all of the stiffness that the words "great classical literature" can exude. We are no strangers to Sharon Watson's curricula. One of Luke's all-time favorite programs is her non-fiction writing course, and two years later, he still refers back to the text every time he has something to write. His last two years of literature study have been done in tandem with his American history studies, so it's been a bit of a hodgepodge. He was happy to try out a program with a clearly defined syllabus. After scrambling to have a good variety of literature to study, I was happy to have a this 70 lesson, two-semester program to simply point to and say "Do the next lesson!" We started with the first book in the program, Pudd'nhead Wilson, by Mark Twain. Luke really liked that this book was included, instead of the usual Huck Finn/Tom Sawyer books. (In all, the program studies six novels and on one memoir, and they cover a variety of both American and British authors.) He s struggled with reading the other books because they are in Twain's trademark "spoken dialect" style, but he found that this one's patois was less thick and was much easier to read. As for the student guide, Luke found Sharon Watson's trademark explanations comfortable. Instead of being a lot of definitions and ideas to be memorized and applied to a book, he liked the laid-back, conversational style. He felt like he was being "spoken to", rather than "spoken at". Above all, he liked her explanation of ideas, rather than just defining them. For example, Luke knew that a pseudonym was a name taken by an author and used instead of his own name, but no one had ever explained to him exactly why someone would do this. It seems like very minor thing, but the program takes the time to share what an author's reasoning might be. He has a better appreciation for authors and their reasoning for why they chose a pen name, and it has helped him better understand the perspective of a writer. For example, when you know the story behind the name "Mark Twain", Samuel Clemen's stories of the antebellum midwest appear far more compelling and authentic than they might if he used his own name. I liked the work-as-you-go Novel Notebook, a defining feature of the program. 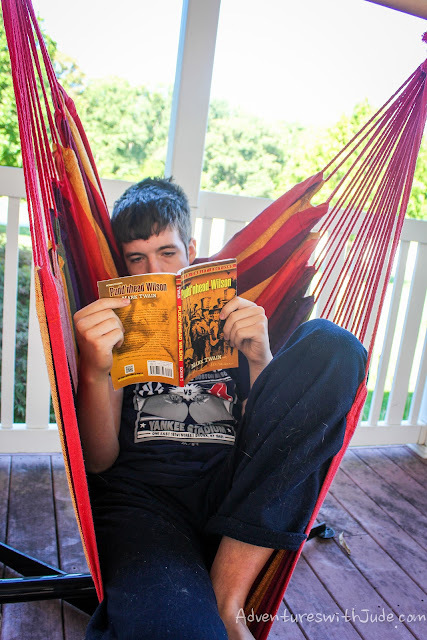 The Novel Notebook allows a student to examine his personal reactions and feelings to the book while he's reading, rather than simply reading and answering questions. Luke wasn't such a fan of it; he found it disrupted his rhythm. He also felt like he was no longer reading a story, but was "reading to find answers." He preferred to read the book straight through and then pick apart themes, etc. He often felt like he was going to have the "wrong" answers because there might be a "better" answer in another chapter. Two companion books support the program instructor. One is the Teacher's Guide that contains answers to all of the student questions. This way, the parent/teacher can read the book alongside the student to discuss in a conversational manner. The second is the Quiz and Answer Manual if the parent/teacher prefers to give and grade test instead of using the online quiz/grading program feature. I liked both of these. While I do enjoy reading literature books alongside Luke, sometimes it's hard for both of us to be sharing a single book. There was enough information in the parent book that I could work ahead of what I had actually read, yet still be able to know if he had paid attention to the book. In addition, the quiz book provided "Opinion Surveys." These were not necessarily graded - in fact, the program says the grade comes from simply completing them - but we found that the discussion that they sparked actually led to a deeper comprehension of the themes, and showed a greater command of the book than simply knowing where specific themes were demonstrated. 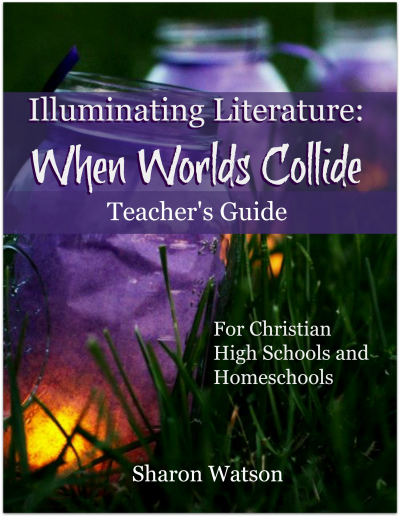 This program is designed to be used in a Christian school classroom, co-op, or individual homeschool setting. We have often found that it is difficult for a program to be successful for all three types of schooling. What works for larger group discussions is impossible with a single student; programs geared to a single student becomes unwieldy in a larger group. However, with this program, there is enough independent work for the student to not need more than general direction, but the discussions can be easily adapted to any number of students simply by changing the methods of discussion (submitted essays vs oral discussion). Once again, we have been spoiled by a Sharon Watson program. Luke has really wanted to do a Plays-and-Playwrights program for his senior year, but is reconsidering to use this instead. He likes the way works are studied enough that he has said he may just do a few of the units "just because they are interesting." (Another specific book in the program that he is looking forward to reading the original Peter Pan by J.M. Barrie.) I think that is probably the highest praise he can give the program; it has made literature more than just a bunch of books and turned reading these classics into something he's excited to do. You can read the reviews below to find out how Crew families used the program, and follow Writing with Sharon Watson on social media at both Facebook and Pinterest.